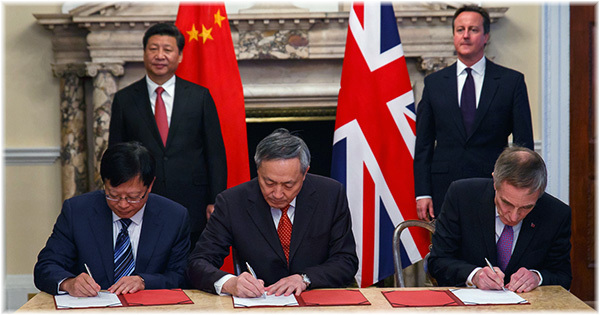 Last week’s big news was Carnival’s announcement, in the presence of the Chinese president and British prime minister, that it was forming a new Chinese-based cruise line (whose ships may fly the UK flag) in conjunction with two Chinese state-owned concerns. Meanwhile, plenty of action is set to take place. 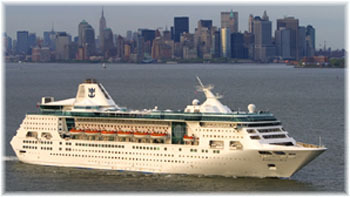 In 2016, Royal Caribbean International will introduce the first newbuilding to China when its Ovation of the Seas sails east, Norwegian Cruise Line will send its Norwegian Star, MSC Cruises its MSC Lirica, Costa and Princess one more ship each and Star Cruises the first of two newbuildings. In 2017, three more newbuildings are set to follow, with the Norwegian Bliss (to be renamed), Majestic Princess and the second new Star ship, while Carnival Cruise Lines and AIDA Cruises enter the China market for the first time with one more ship each. The number of Chinese cruisers, projected at 1.1 million this year, is expected to grow to 2.5 million within the next five years. And China has recently outlined plans to build ten new cruise ports during that same period. With the expectation that the Chinese cruise market could eventually become the largest in the world, announcements have been flowing recently from all four of the largest cruise ship groupings. No sooner had Norwegian Cruise line announced that it would be assigning its new 4,200-berth Norwegian Bliss to China in 2017 than Carnival Corp & plc jumped on the bandwagon with news that it would bring its own AIDA Cruises and Carnival Cruise Lines brands to China when they join Costa Cruises and Princess Cruises in the same year. 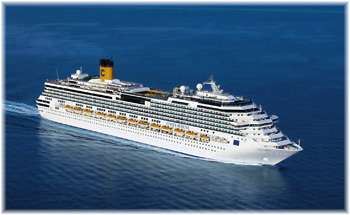 Costa and Princess will each bring one extra ship to the trade next year, bringing the total to six, while AIDA and Carnival will each contribute another ship the year after. Of the news from Norwegian Cruise Line, one of the most interesting pieces of information was that the company has recently increased its China office staff in Hong Kong to 200 as it prepares not only to re-enter the Chinese market for the first time since 2001 with its 2,348-berth Norwegian Star in 2016 but also to enter the market with new tonnage in 2017. Meanwhile, Royal Caribbean International, which has been cruising from China with big ships for several years now, will introduce its 4,180-berth newbuilding Ovation of the Seas to China next year before she continues to Sydney in November for a season in Australia. Elsewhere, Hong Kong-based Star Cruises is building two 3,360-berth ships for delivery in late 2016 and late 2017, while MSC Cruises will be sending the recently-stretched 1,750-berth MSC Lirica to China next year. But the really big news last week, announced in the presence of UK Prime Minister David Cameron and Chinese President Xi Jinping, was that Carnival Corp & plc is forming a $4 billion joint venture with two Chinese state-owned firms to launch a multi-ship cruise line to be focused on the Chinese market. The amount is to be paid in over ten years. 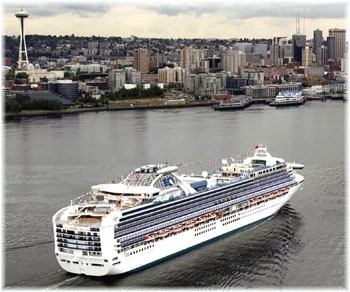 Carnival Corp and China’s largest shipbuilder China State Shipbuilding Corp (CSSC) will buy and operate cruise ships for the yet-to-be named cruise line. CSSC and sovereign wealth fund China Investment Corp will each own 30% of the joint venture while Carnival will own the remaining 40% and manage the ships. In addition to building ships for the new Chinese cruise line, it is likely that ships will be drafted in from among the ten Carnival Corp brands in order to start operations. It is also likely that Fincantieri will soon join in on the shipbuilding side. That this announcement was made in London underlines the fact that Carnival Corp & plc is not just an American company but an international firm with stock market listings in both London and New York. Although the Carnival brands involved in China are based in Italy, Germany and two in the US, much of Carnival’s planning and shipbuilding activity is carried out from the UK. For decades now, it has had a shipbuilding and design office there, dating back to Technical Marine Planning, which it later acquired, and the design of the Tropicale in 1981. The new ships, once size and design have been decided upon, will be managed by Carnival and could quite possibly fly the UK flag. Some Carnival ships, particularly the 2,702-berth Japanese-built Diamond Princess and Sapphire Princess that already trade in Asia, are registered in the UK. These ships benefit from the UK’s competitive tonnage tax system. At the same time the UK register is looking for more business. The Majestic Princess, although not part of this joint venture, is now being built for year-round service specifically for Chinese guests, and is likely to be registered in London when she is delivered. 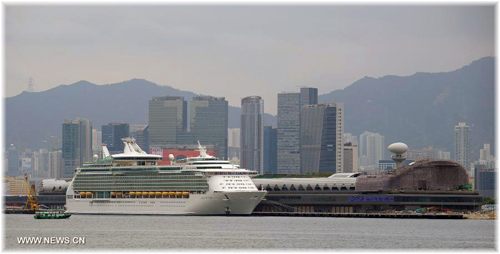 Many of China’s existing cruise and passenger fleet, such as it is, are already registered outside the country rather than flying the Chinese flag. While Carnival Corp chief operating officer Alan Buckelew, who formerly headed up Princess Cruises, is Carnival’s points man in Asia, effective last month, the company has appointed Michael Ungerer as chief operations officer for Carnival Asia. As former president of AIDA Cruises, Ungerer will help lead Carnival Corp’s growth plans across Asia, and most particularly in China. In news breaking last week from Pullmantur Cruises, the 1,600-berth Empress will be going back to Royal Caribbean brand next spring. In turn, the Monarch will head for Europe in 2016, reducing concentration on Latin America, where she has been employed year-round until now. 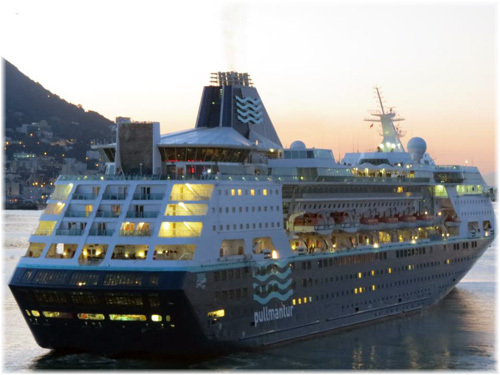 Pullmantur will now concentrate more on Europe, in particular its markets in Spain and France. While some have speculated that the Empress of the Seas might join Azamara Club Cruises as a third ship for that brand, the Empress has only 69 balconies compared to 232 on the Azamara ships and with her small cabins, would need a substantial rebuilding. It is much more likely that she will be assigned to the 3- and 4-day Florida-Bahamas trade for which she was built in 1990. An added attraction to this deployment could be that in terms of future employment, as the smallest ship in the Royal Caribbean International fleet, at just 692 feet and with less than a 25-foot draft, she is capable of getting into most ports in Cuba. She could, for example, replace the 700-berth Adonia in the Fathom fleet if the latter were to go back to P&O Cruises in the UK. When introduced in 1990 as Nordic Empress, the new ship was the first to have been custom-built for the Miami-Bahamas trade since Henry Flagler’s 125-berth Miami of 1898. And she remains so. Even though Disney has also built ships for the Florida-Bahamas trade, they sail from Port Canaveral rather than Miami. P&O Cruises Australia, which announced earlier this month that it was acquiring Princess Cruises’ 1,950-berth Dawn Princess, has now stated that she will be renamed Pacific Explorer when she joins the P&O Australia fleet in May 2017. The 1997-built Dawn Princess has been cruising from Australia under the Princess Cruises brand since 2008, and will be twenty years old when she transfers over. 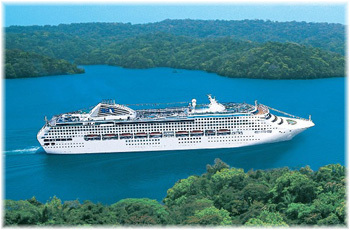 The Dawn Princess will be replaced in Princess Cruises’ Australia-based fleet by the 3,114-berth Emerald Princess, which will be based Down Under from late 2016. The 77,499-ton Pacific Explorer will be the largest ship to date to join P&O Australia, the latest of which are the 1,266-berth Pacific Aria and Pacific Eden. This pair, the former Ryndam and Statendam, will join P&O Australia from Holland America Line on November 25, when they will be christened together in Sydney harbour. 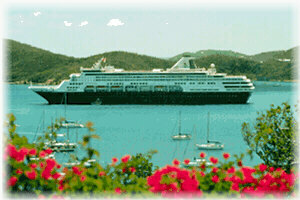 Present that night will be the full P&O Cruises Australia fleet of five ships. The Pacific Explorer will be based in Sydney and when she joins the line in 2017 she will bring the P&O Australia fleet to a record six ships, a long way from the days when the 44,807-ton Canberra alone cruised from Sydney. 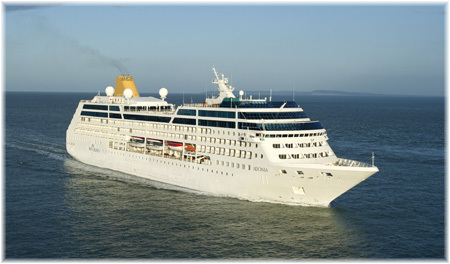 P&O Princess Cruises’ acquisition of Sitmar Cruises in 1988 saw the 20,586-ton 1,280-berth Fairstar join the P&O Australia fleet, while the 21,946-ton 900-berth Fair Princess was added in 1996 and the 46,087-ton 1,250-berth Fairsky in 2000, as the renamed Pacific Sky. In the period since, the P&O Australia fleet has become a home for all three of the new ships ordered by Sitmar Cruises just before the Princess takeover.